This week employment news starting from 10 December – 16 December 2016 has with it various job notifications from some eminent organizations across the country. Banks, PSUs, Ministry of Defence are the ones which had major vacancies to be filled up. 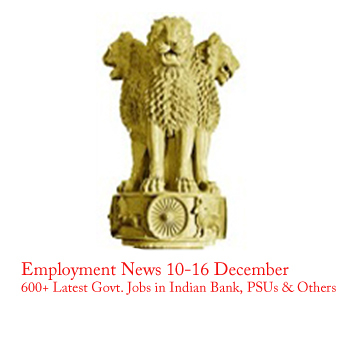 This week employment news starting from 10 – 16 December 2016 has with it various job notifications from some eminent organizations across the country. Banks, PSUs, Ministry of Defence are the ones which had major vacancies to be filled up. Apart from them, other job vacancies like faculty jobs, civil judge jobs, engineering jobs are included in it. Scientist jobs, technical assistant jobs are also much searched jobs that this week’s employment news has covered. Employment news is one the most sorted out section and aspiring candidates should keep an eye on it to know the single details about what employment news have carried the following week. All notifications published in this are important and all types of eligibility criterion candidates can find jobs posts for themselves through it. Some of the jobs need to be applied online and others offline. For online process, keep the scanned copy of all major documents with you before applying. Let’s get a glance of the major jobs that this week’s employment news has.